Two major egg and embryo tank failures at fertility clinics in Ohio and California raise questions about how facilities are monitored. After two major mishaps at separate egg freezing clinics in the last week, women who have had the procedure or were considering it may be feeling stress. Two tank failures at fertility clinics in Ohio and California caused the possible loss of thousands of eggs and embryos, devastating hundreds of patients. 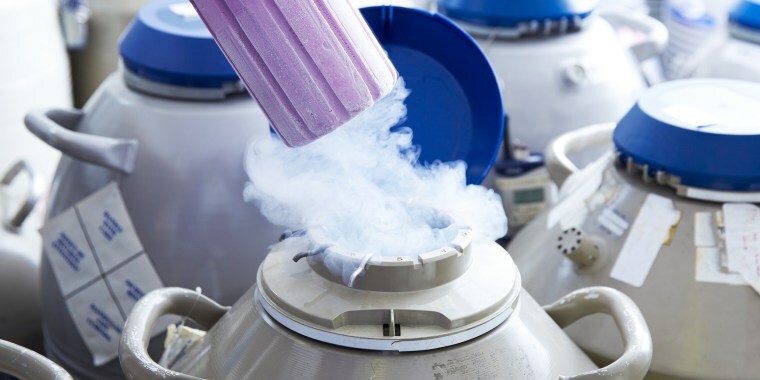 The malfunctions may have thrown a negative spotlight on the egg freezing industry right now, but in decades of cryopreservation these are the only two known major tank failures at fertility clinics, experts say. Dr. Eric Widra likened the risk of major tank failure to that of being struck by lightning. “It’s an incredibly troubling coincidence, but I don’t think we should be panicky,” said Widra, medical director of Shady Grove Fertility in in Rockville, Maryland. While the tank failure at University Hospitals Fertility Center in Cleveland appears to have been catastrophic, it’s not yet clear whether eggs or embryos were lost in the incident at the Pacific Fertility Clinic in San Francisco. Officials at Pacific Fertility could not be reached for comment, although an earlier statement from the clinic said one of the storage tanks was discovered to be low on liquid nitrogen, the substance that maintains the low temperatures that keep eggs and embryos frozen. "The vast majority of the eggs and embryos in the lab were unaffected, and the facility is operating securely," the statement said. Dr. Mark Jutras is perplexed by the situation in California. It didn’t sound as serious as the tank failure in Cleveland. Currently there are two different sizes of tanks. The larger ones are set up to refill on their own when levels get low, Jutras said. Smaller tanks need to be refilled manually. In either case, tanks are set up to ring an alarm if there’s a problem. These days most fertility clinics send eggs, sperm and embryos that will not be used right away to long-term storage facilities. “They’re cheaper in the long run and they all have flawless records,” Jutras said. Which begs the question: Do the two tank failures mean that fertility clinics need more supervision? Currently CAP is investigating the two tank failures, but they don’t have any estimates as to when those studies will be done. In the meantime, the incidents are likely to spark other research, Penzias said. "Anytime there's a tragedy it's good to reflect and say, if it happened to them, could it happen to me?” he explained. “And if it could, how can I prevent it from happening. If we can't learn from tragedies we've lost a good opportunity. That's why I will be very interested in hearing ultimately what happened, when facts come out." Does the equipment have independent alarm sensors? Are the alarms checked frequently? If no one is at the facility when alarms go off, what happens? Are there back up generators? Is there a back up power source? Are there redundant tanks to transfer eggs or embryos that may have been in a tank that malfunctioned? Ask a facility about its record: Have they had any issues in the past? Information should be made easily accessible to a patient. If you're having your eggs shipped from one facility to another, ask which carrier handles the shipment and if they've had issues in the past. Insure the shipment. Though it's important to note, these two clinics may have had all the right answers. As costly as it is to retrieve and store frozen eggs and embryos, there is no amount of money or safeguards that can guarantee a successful pregnancy.